The banjo has always been one of our favorite instruments, however the banjo is being featured in unusual genres these days. The banjo was really made for one musical category – the banjo’s destiny you could say – and that, friends, is bluegrass. We’re not talking about your grandfather’s knee-slapping ditties. 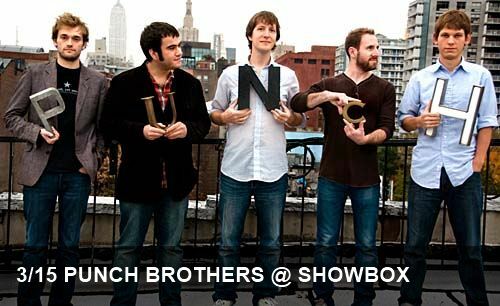 We’re talking about Punch Brothers, bluegrass’ young, dashing and incredibly talented new hope. There was a bluegrass revival in the early 2000s (think early Sufjan and the like) but the Punch Brothers command a double take at the genre. While the banjo is front and center, Punch Brothers also feature the fiddle, the upright bass, the mandolin and all our other favorite stringed instruments. Their repertoire ranges from melodic and medieval to rollicking and lively, and their shows almost guarantee there won’t be a toe that isn’t tapping in the whole venue. Even the Soggy Bottom Boys would be smiling.